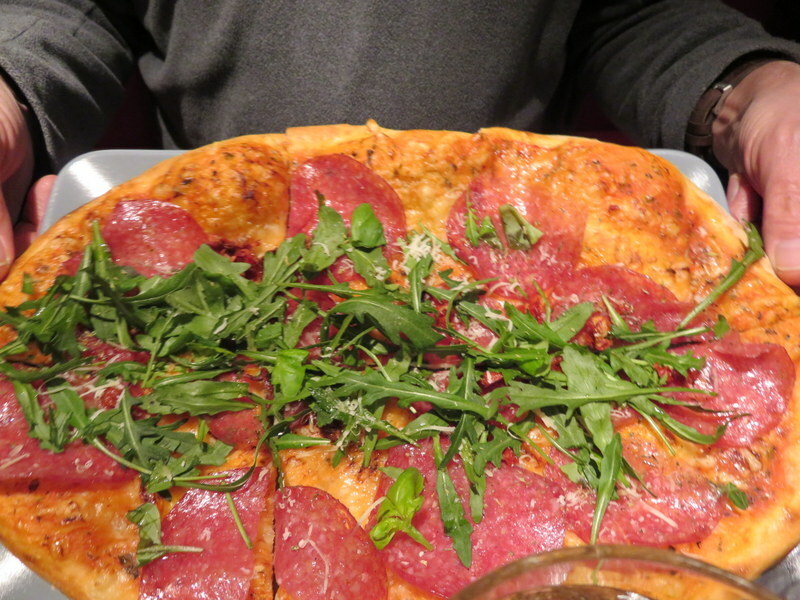 What a surprise to find good pizza in Salzburg! We were not going to feed the need this particular Friday, but in consulting Trip Advisor I found Organic Pizza ranked very high, so we thought we’d give it a try. Heeding a TA review that advised reservations, I called and was advised 8:00 pm would be the best time to show up. On arrival, we found the place was jammed with about 15 people. Seriously, it was SRO and really nowhere to stand at that. The very nice owner who had taken my call asked a family of 4 sitting at a table for 6 if they could make room, and we settled in on tall stools. 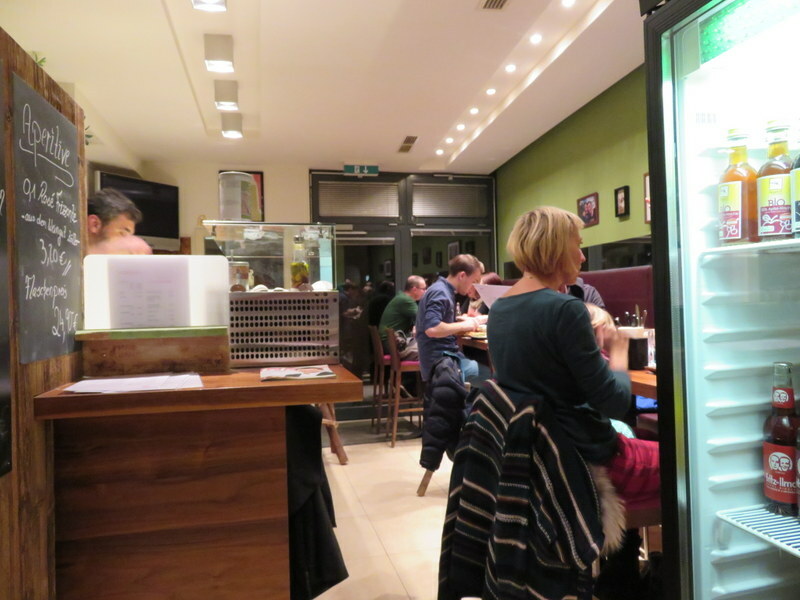 They serve a very nice Zweigelt Austrian red wine by the glass, and we ordered a couple of pies. One can choose either a spelt or a wheat crust, and for the vegan pizza lovers, they have vegan cheese. While this pizza cannot compete with Da Remo, Dar Poeta or La Pratolina (for one thing there’s no wood-fired oven), they make a respectable and tasty pizza. We are happy we had a chance to try it. Ric’s choice spicy salami and rocket, also with mozzarella. It would not be fair to put Organic Pizza through my usual pizza rating system. It is too small to have ambiance, there is one service person and one pizziaola, her husband. The selection is limited but they use very good ingredients and have a sense of creativity as well. I will give it a somewhat random 7 points. If you are ever in Salzburg and cannot face another schnitzel or semmelknödel, do take a very pleasant walk through the pedestrian section of Salzburg’s New Town and treat yourself to a pizza. My pizza wtih mozzarella, ham and rocket. All organic, or “bio” as it is called here. After a chilly 15 minute walk, we found a warn reception at OP. My favorite view at dinner.